in the Fall and again in the Spring. The events raise much needed funds for the Media Center while offering great books for our children to read and learn from. 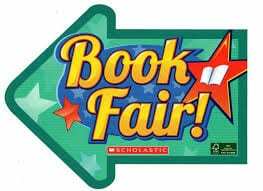 You will receive a Scholastic book fair sales flier sent home with your student when the fair is coming! You can buy books at the fair, or online during the sale period. Your student will get a chance to visit the fair on their designated class media day, and can also visit before school hours when it is open. There are also event days for grandparents, parents and other special friends to come share lunch and t hen shop together at the book fair. Stay tuned to the Gator Blast for future dates. If you are interested in volunteering at the Book Fair we can use many helpers! Everyone is welcome to help out for a shift or more.